Parade Park	The Parade athletic fields are located between the Minneapolis Sculpture Garden and Parade Ice Garden. Spring Lake located on the West side of the park. A pay parking lot is available. Maintenance is increasing at all neighborhood parks, thanks to additional annual funding from the 20-Year Neighborhood Park Plan (NPP20). This initiative also funds ongoing rehabilitation and major project to restore neighborhood parks and help address racial and economic equity. Name: The name “The Parade” was adopted October 31, 1904. The name was apparently suggested by park commissioner John Bradstreet because the land was next to the National Guard Armory and was used as a parade ground by the guard. On the date the name was approved, Thomas Lowry, who donated a large portion of the land and whose home on Lowry Hill overlooked it, had noted his approval of the name. The name applied not only to new land donated and purchased for a larger park but also to the first land acquired at the site, which included Spring Lake. The original park had been known as Spring Lake Park from the time it was acquired in 1893. The name of the lake predates park board records. For a brief time in 1893 the board considered renaming the lake, Hiyata Lake, on the suggestion of William Folwell. He claimed the term was a Native American word that meant “back by the hill.” The board voted to keep the name Spring Lake. Despite the board’s refusal to change the name, however, park board records and inventories for the next several years listed the property as Hiyata Park. The name of Spring Lake was not changed when The Parade was named. Land for a park to the west of Central (Loring) Park was first proposed by Thomas Lowry in November 1885. Lowry would later be the primary figure in the acquisition of the park at the foot of the hill that was named for him, Lowry Hill. His mansion was on the hill. Lowry was the owner of the Minneapolis Street Railway Company. He and his company would play an important role in the development of Minneapolis parks, in part through collaboration with the park board to provide a pavilion and entertainment at Lake Harriet to stimulate ridership on street cars to the lake. The park board considered many land acquisitions in its first years of operation, so did not act on Lowry’s proposal at the time. But within a few years, as it shifted its focus to the Lake District in southwest Minneapolis, and land owners offered to donate and pay for the development of land, the park board viewed the area more favorably. As was often the case with the park board in its early years it expanded the park system when it was offered free land. The park board’s first president, Charles Loring, had secured the donation of most of Lake Harriet in 1885 and thought he could do the same at Lake of the Isles. Loring was the driving force behind acquiring Lake of the Isles as a park that he envisioned would connect by a parkway along Mount Curve and Hennepin Avenue to Central (Loring) Park. In 1885 and 1886 he personally negotiated for the donation of the land around Isles and the connecting parkway. In 1886, he also secured a donation of land for Kenwood Parkway from Mount Curve to the west side of Lake of the Isles. The proposed route for the connecting parkway changed in 1887, however, when a group of property owners led by Edward Twitchell, offered to donate land for a parkway, a strip 100 feet wide, connecting Central Park to Kenwood Parkway across the swampy land at the base of Lowry Hill, instead of along the top of the hill as Loring had imagined. The new parkway would climb the steep hill into Kenwood southwest of Spring Lake. That offer of land was originally rejected, with even Charles Loring voting against it. The following year, however, the offer was sweetened by area landowners, including Thomas Lowry. They would not only donate the land, but they would pay for building the parkway across it under the supervision of the superintendent of parks. The park board formally accepted that offer in July 1888. The acquisition of the first land for what is now part of The Parade was decided—but not without some acrimony. At the same meeting that the board accepted the offer of the land and money for improvement, park commissioner Byron Sutherland demanded to know on whose authority park superintendent William Berry had already spent more than $4,000 on improvements to Kenwood Parkway. The park board meeting was promptly adjourned and board president Loring did not reconvene the board for more than four months. No explanation was ever provided in board proceedings for the expenditure on the new parkway. The acquisition of more than a parkway through the land waited another five years. Petitions for the park board to acquire Spring Lake beside the new parkway were received by the board in 1891, but as with the earlier parkway, the board postponed action on those requests. Again it was the offer of free land and the money to develop it that prompted action. In early 1893 the park board formally agreed to buy ten acres of land around Spring Lake from Lowry, Bassett and others for $75,000. The attractive part of the offer, however, was that the same property owners agreed to pay for the property over ten years through assessments on their remaining land in the area. The net cost to the park board would be nothing. Once again Lowry also offered to donate the money—$10,000—to the convert the land into a park. That was the last property acquired by the park board for the better part of a decade as the city and the country sank into economic depression following the Panic of 1893. When the park board resumed acquiring land in 1902, the expansion of Spring Lake Park was a priority. Citing a need for more land “near the central part of the city,” the park board acquired another 44.5 acres of land in 1904 that gave The Parade the basic shape we know today. Once again it was donated land that was at the heart of the acquisition. More than half the land was donated, twenty acres by Lowry. Other donors were William Dunwoody, on whose remaining land Dunwoody Institute was later built across from the park, and Security Bank. The park board also purchased 21 acres at a total cost of nearly $110,000 and most of the cost was once again assessed on nearby property. The initial grading and seeding of the new park land, much of which was low ground, was paid for by another $11,000 donation from Lowry. Lowry had initially given slightly more than 20 acres to the park board in the transaction, including a plot of land near the railroad tracks north of the park that he had agreed the park board could sell to create a maintenance fund. He later informed the board that he had made a mistake; he had already conveyed that land to the railroad in an earlier transaction and asked the park board to grant the deed for that land to the railroad. The park board complied with the request of one of its most generous benefactors. Over the next two years, perhaps to compensate for his error, Lowry made additional donations to the park board for the Parade, including an “entrance” to the park in the northeast corner, made in conjunction with the Church of the Immaculate Conception, and the land in the southeast corner of the park, which is now the Sculpture Garden across from the Walker Art Center. The park board had voted to acquire the latter parcel by condemnation to enlarge the park. When faced with the board’s decision, Lowry donated the land with a condition that the park board could erect no buildings on it. The land occupied by the Armory on Lyndale Avenue was the only small parcel of the present Parade and Sculpture Garden that was not then owned by the park board. The 1.2 acres of land on which the Armory sat was finally given to the park board by the state in 1934 at the time the Armory was demolished. From almost the time The Parade was expanded in 1904 it was coveted as a recreation park. In early 1905 the board received petitions from the YMCA and others to use The Parade as a baseball field. This was at a time when the park board maintained no athletic fields of any kind on park property and only a year earlier had installed the first few swings for children on park property at Loring Park. Parks were still generally viewed as places for quiet retreat and relaxation, not as places for active recreation, such as ball games, or even as playgrounds for children. The request from the YMCA for a baseball field at The Parade came from Clifford Booth, the director of physical training at the YMCA. Two years later, in 1907, after the park board had installed gymnastic and playground equipment in two parks, Booth volunteered to provide instruction and supervision at the playgrounds, and the next year became the park board’s first supervisor of recreation, a part-time job. In the 1905 annual report, the park board recommended establishing a recreation park, its first, at The Parade. In 1905 the park board also gave approval to the city to build a highway along the northern edge of the park. That highway became Highway 12 and later I-394, which in the 1960s took nearly 21 acres of The Parade. When the park board’s new superintendent of parks, Theodore Wirth, made his first recommendations to the park board in March 1906 he announced that in his preliminary plans for the park he had set aside two blocks for a football field. Because the park board had no money to build the fields at the time, however, he recommended that the park board grant a request from the city engineer to use that land to store city supplies, a recommendation that the park board approved. Petitions for the use of The Parade steadily grew. In 1906 the Northwest Interscholastic Athletic Association asked the park board to create athletic fields at the Parade for the city’s high schools to use. Another request was for concerts to be provided at the park, and in June of 1906 the park board provided its first concert there. In 1907 the park board reported that The Parade was already “one of the most useful and valuable parks”—and reported that Lowry, Dunwoody and others had contributed nearly $10,000 more for further improvements to the park. And requests for more facilities came in, including tennis courts and a cricket field. In the spring of 1908 the superintendent of Minneapolis schools, Charles Jordan, who had joined Charles Loring and William Folwell a decade earlier in urging the creation of playgrounds in parks, formally asked the park board to provide baseball fields and tennis courts, along with locker rooms and showers, at The Parade. That summer five baseball fields were laid out at The Parade and there was such demand for the fields that new recreation supervisor Clifford Booth implemented a system of permits for using the fields. Two baseball leagues, the Commercial League and the Flour City League, began playing their games at The Parade. When the football season came around, the city’s high schools asked for permission for their football teams to practice and play at The Parade and the park board instructed Wirth to erect football goal posts on the field. In the 1908 annual report, Wirth “heartily recommended” approval of the requests from high schools to use the grounds for sports and presented his first plan for the layout of athletic facilities at The Parade. Included in his plan were baseball and football fields, with a grandstand for spectators, and basketball courts. That summer two more baseball fields were added, still without fencing or backstops, bringing to seven the number of baseball fields. (The first backstops were not installed until 1911.) 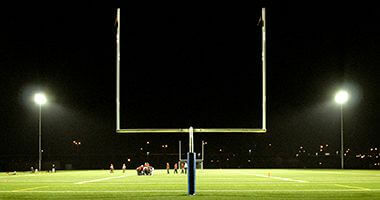 Booth reported that the fields were used every night that summer for practices and every Saturday for games. Athletic events were not permitted in parks on Sundays. With the popularity of the fields at the Parade, Wirth presented a new plan for a grandstand at the fields in 1911, but added that the park board needed a donation from a public-spirited citizen to pay for it. 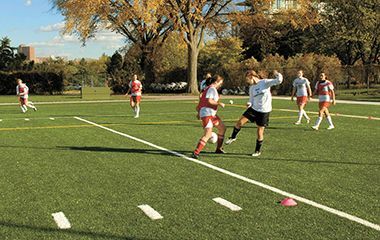 As important as athletic uses of parks were becoming, the expense of providing accommodation for athletes was still not seen as a primary responsibility of the park board. In addition to beginning the grading of the fields, the park board also built four tennis courts at the Parade in 1911—also without backstops. In an unusual agreement, which set a precedent that continued for decades, the board agreed to a contract with a private tennis club for maintenance and operation of the courts. The grading and reseeding of the fields at Parade took them out of commission for three years. One of the problems, as in most parks in the city, was that the park was created on low, wet land. Before the fields could be constructed the land had to be filled and the fill had to settle before it could be graded, top-dressed and seeded. Theodore Wirth also noted that the fields could not be completed earlier due to a shortage of funds. 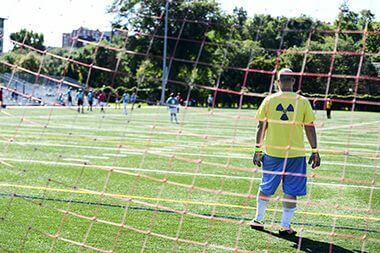 (The low relative priority of athletic fields in the park system, despite persistent demand for them, is demonstrated by the fact that in 1911 the park board received authorization from the state legislature to sell $1 million in bonds for park improvements. With extensive lake dredging and parkway building planned or underway at that time, however, sufficient funds were still not available to complete the grading of the new fields, which meant that another full year passed before they were usable.) 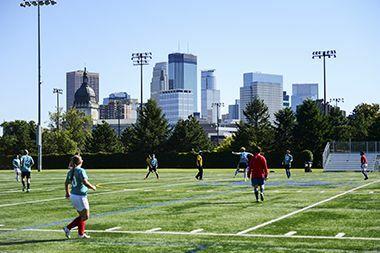 Without the fields at the Parade, North Commons and the first Longfellow Field (at Minnehaha and 28th) became the venues for football games in the city. While the fields were under construction, the park board gave permission in 1912 for Woodrow Wilson to give a presidential campaign speech at The Parade. Another attraction at The Parade began in 1913 when Theodore Wirth requested the use of the ground south of the Armory for an ornamental garden. Wirth wanted to create a show garden that year for the Society of American Florists and Ornamental Horticulturists, which was holding its national convention at the Armory. The “Convention Garden,” with more than 20,000 plants, was such a hit with the florists and the public that it became the premier garden in the city along with the rose garden at Lake Harriet. In 1914 park board president Edmund Phelps recommended continuing the garden, but renaming it the “Armory Garden.” The Armory Garden remained long after the Armory itself was torn down in 1934. The park board maintained the garden until 1967. Each year the central bed of the garden was used to spell out in flowers an important event in the city. In 1964, after Look magazine had paid tribute to the city, the flowers spelled out “All America City,” the title the magazine had conferred. The newly graded and planted Parade fields—seven for baseball and two for football—opened for play in 1914. The Parade immediately regained its status as the premier athletic ground in the city primarily due to its central location. But that central location also put The Parade at the center of many discussions of other city facilities. From the late 1910s into the 1930s many city leaders, including park commissioners, recommended The Parade as the site of a new auditorium and civic center. In 1919 Wirth even proposed creating an “auto tourist camp” at The Parade similar to the one the park board later operated at Minnehaha Park. In 1923 the park board approved use of the northern section of The Parade as a polo ground with barn and stables. This was after the park board had rejected Wirth’s suggestion to turn Bryn Mawr into a park for equestrians, including polo players. Still the park was without amenities other than playing areas. In 1923 park commissioner Maude Armatage suggested that the park board consider adding a “comfort station”—toilets—to the property. No action was taken on her suggestion. Despite the lack of amenities the popularity of the athletic fields continued. In 1926 a city-wide track and field competition was begun again, under the sponsorship of the Minneapolis Tribune. More than 2,000 people participated between the children’s events during the day and adult contests at night. By 1932 participation had increased to nearly 3,000. In 1930 Wirth advocated constructing an auditorium at the Parade and three years later he added a stadium to the list of facilities that he believed were needed there. With the onset of the depression and an extreme shortage of funds to develop or improve any park facilities, Wirth suggested that a facility at Parade, and lighting for the tennis courts, could be paid for by user fees. Even without action on buildings, the park board created five more baseball and softball fields in the park in 1931. While plans for a stadium funded by the Public Works Administration fell through, in 1933 the park board added lights, a fence, and bleachers to hold 2,000 people at the best baseball field and authorized an admission charge of ten cents at some events to recoup costs. For the first time night baseball games were played at Parade. The policy of charging admission to events proved successful at the baseball field. Improvements were made to the field several times, including new fencing and bleachers over the next fifteen years. By 1946 the maximum allowable charge for admission had increased to fifty cents. The tennis courts at the Parade got a new look in 1934 in preparation for hosting the National Public Parks Tennis Championship. The championship required clay courts, of which the city had none, so the park board’s first clay courts were built at The Parade along with a tennis center building. At that time the park board had 175 tennis courts in parks throughout the city, but all of them had either concrete or limestone surfaces. The new courts provided a home court advantage to William Schommer and Charles Britzius of Minneapolis who won the men’s doubles title. (The tennis center built for the event was operated by the park board until 1942, when management of the center and the courts were taken over by the Minneapolis Tennis Club. Despite hopes that the new clay courts would pay for themselves in user fees, the courts had operated at a slight deficit.) Tennis was so popular at the time that when the state donated to the park board the site of the Armory, which was razed in 1934, Wirth proposed converting half of that land into tennis courts too. No further developments occurred at The Parade through World War II although the new park superintendent in 1936, Christian Bossen, repeated the call for a recreation center at the park. It wasn’t until the park board began planning its post-war agenda that plans for a stadium at Parade gained momentum. Various branches of city government were encouraged to develop plans for “post-war progress” partly in hopes that government spending after the war could help prevent a return to depression. On the park board’s list of post-war progress projects, totaling $11.7 million, was Parade Stadium at a projected cost of $1 million. It was one of the few projects on the park board’s list that was funded by city bonds until the 1960s. In 1949 and 1950 plans were developed and approved for a 17,000-seat football stadium, a 4,000-seat baseball stadium and parking for 600 cars. Construction plans were held up due to objections from homeowners in the Lowry Hill neighborhood, but construction finally began in 1950. Just after construction began however, the National Production Authority prohibited the construction of recreation and amusement projects in order to conserve materials for defense purposes as the nation went to war in Korea. Mayor Eric Hoyer and park superintendent Charles Doell went to Washington, D. C. to request an exemption from the ban because the stadium construction had already begun. They returned home with permission to finish the stadium—and to complete another park project that was already underway, the construction of Waite Park. The new stadium opened in the fall of 1951. The biggest event at the stadium that fall was an NFL exhibition game between the Green Bay Packers and the San Francisco 49ers, which drew a standing-room crowd of 20,000. The annual NFL game, promoted as a fundraiser by the Catholic Welfare Association, helped make the new stadium profitable until the game was moved to Bloomington’s new Metropolitan Stadium in 1956. The first NFL exhibition games demonstrated the appetite in the area for professional football, which eventually helped land an NFL franchise for the state in 1961. 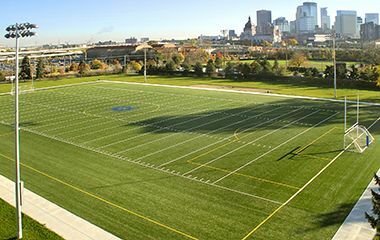 From the time the stadium was built it became the home of Minneapolis high school football. The first year the stadium was the venue for eight football games, but the next year 47 were played there. To make room for the new stadiums, the tennis center at The Parade was transferred to Nicollet (King) Park. Post-war plans for the development of The Parade originally had included an ice arena and an auditorium for basketball games, but those parts of the plan were put on hold for lack of funds. The basketball auditorium would never be built on the site, but more than 35 years later, an ice arena was added to The Parade. In its first years of operation, thanks in part to the annual NFL exhibition game, the new facilities at The Parade operated at a profit. In addition to regular football and baseball games, the park hosted the World Softball Championships in 1954 and again in 1958. After the loss of the NFL exhibition game in 1956, the park board replaced some lost revenue by leasing the stadium to a circus for a couple weeks in the summer of 1957. Over the next several years however, the stadium operated at a slight loss due to maintenance costs. What made the park profitable again was not the stadium, but the parking lot. With the construction of the Guthrie Theater in 1963, the park board began to see substantial revenue from the stadium parking lot where many Guthrie patrons parked. The Guthrie also benefited from having the park outside its doors. Patrons not only parked in the park lot, but waited for performances to start by ambling through Kenwood Garden, the old Armory Garden. By then, however, The Parade had begun a change that would dramatically alter the park and its setting. In 1962, the first parts of The Parade were lost to freeway construction, a development that would eventually shrink the park by a third and form stark boundaries on two sides of the park. Land to the east of Parade was taken for I-94 severing the park from Loring Park and later more land on the north side of the park was taken for I-394 placing a freeway a few feet from the edge of Spring Lake. In the end the park lost 21 acres and seven playing fields to highways. One benefit of the loss of land at The Parade to freeways was that the park board acquired from the state in exchange part of the Wabun picnic area on the Mississippi River bluffs near Minnehaha Falls. The Parade finally got an ice arena, the first for a Minneapolis park, about the time the Sculpture Garden was being completed in 1988. At that time the Minneapolis Auditorium, the venue for high school hockey games in Minneapolis, was razed for the construction of a new convention center. An ice arena at The Parade, initially proposed in 1950 when the stadium was constructed, was finally built in 1988, at a cost of $4 million, primarily to provide a practice and game venue for Minneapolis high school hockey teams. An additional performance space was added to the ice arena in 1997 prior to the 1998 World Figure Skating Championships that were held at Target Center. Two years after the Ice Arena was built, a Parade Stadium that was well past its prime was demolished. 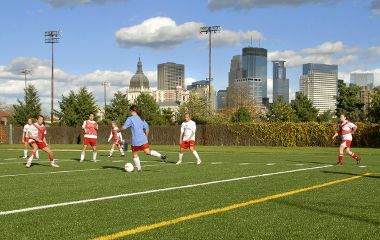 In 2006 a new synthetic turf field was installed at The Parade for soccer and football. A new baseball field was constructed to replace a field lost to the expansion of the Sculpture Garden to the east. 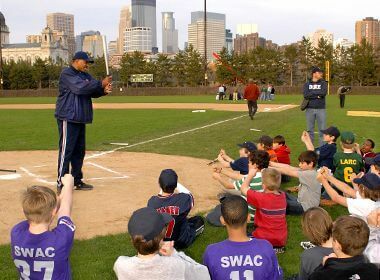 In 2012 the new field (along with new fields built at Neiman Sports Complex) hosted the Reviving Baseball in Inner Cities (RBI) World Series, in which 24 elite youth baseball and softball teams from around the United States and Dominican Republic competed in three divisions. The baseball field was upgraded in 2014 to include a new scoreboard (paid for by Augsburg College, which uses the field for home games) and a new irrigation system paid for by the Minnesota Twins Community Fund. In 2015 a $9 million upgrade was completed at Parade Ice Garden. The comprehensive renovation improved the arena’s energy efficiency through a number of projects spanning from the basement to the roof. A rooftop solar installation was also part of the project. It provides 10-15 percent of the ice arena’s annual electrical needs. At the height of the Cold War, on April 20, 1960 the park board approved a request from Minneapolis Civil Defense to construct a demonstration atomic bomb fallout shelter at The Parade. An earlier decision to place the fallout shelter in Nicollet (King) Park was rescinded after objections from the community. History through 2008 written by David C. Smith, with updates from 2009 to present written by MPRB. 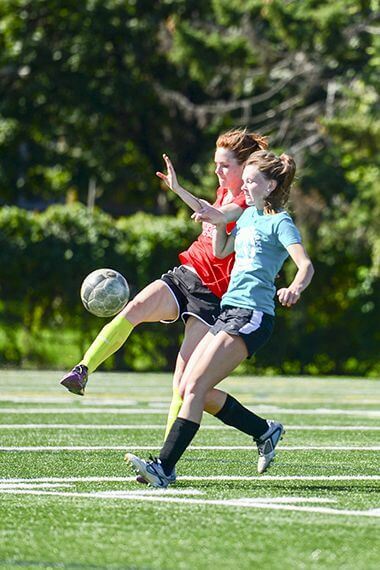 To reserve a field, court, or rink visit our athletic permit page.